SMS Manager for Symbian represents all messages (SMS, Smart SMS, MMS, E-mail and others) stored in your phone. SMS Manager for Symbian allows you to read Inbox, Outbox, Drafts, Sent, My folders, Mailbox folders content, display basic message types - SMS, MMS, E-mail, Beamed (received via BT or IrDA), BIO (Picture message, Operator Logo, Ringing tone, WAP access point), read and display file attaches for MMS, E-mail and Beamed messages. Represents messages SMS, Smart SMS, MMS, E-mail etc. stored in your phone. ...... BT or IrDA), BIO (Picture message, Operator Logo, Ringing tone, WAP access point), read and display file attaches for MMS, E-mail and Beamed messages. SMS Manager for Symbian also can create and delete custom message folders, delete messages from your phone and move them between folders. You also will be able to create and send both plain and Unicode SMS messages to individual recipients as well as to contact groups. 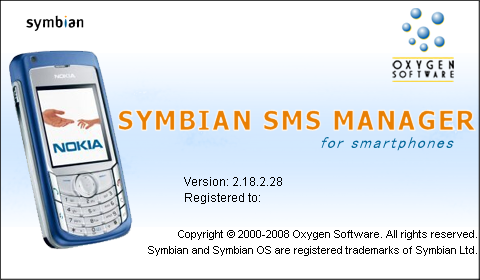 SMS Manager for Symbian works under Microsoft Windows 2000, Windows Server 2003, Windows XP and Windows Vista operating systems family via Nokia DKU-2/CA-53/CA-70 cable (for Nokia models), Bluetooth or IR (Infrared) connection, Samsung PC-DLC cable (for Samsung SGH-D720/720S/728/730). Qweas is providing links to iSMS Manager for Symbian as a courtesy, and makes no representations regarding iSMS Manager or any other applications or any information related thereto. Any questions, complaints or claims regarding this application iSMS Manager for Symbian must be directed to the appropriate software vendor. You may click the publisher link of iSMS Manager on the top of this page to get more details about the vendor.